Many people think of Voltaire (1694-1778) as quintessentially French and are startled to learn that he lived in England from 1726 to 1728. Gaining fluency in English, he boasted that he could swear as “boldly as any English lord”! More importantly, he became well acquainted with three of Augustan England’s major writers—John Gay, Alexander Pope, and Jonathan Swift. 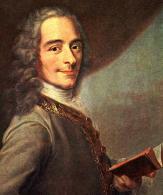 Voltaire also had intermittent contact throughout his life with the writer Lady Mary Wortley Montagu. Lady Mary may be best known either for bringing the practice of vaccination for smallpox from Turkey to England or for being the object of Pope’s adoration and, later, scorn. Her writing deserves a wider audience. This seminar will attempt to give readers a sense of the work of these five writers and an understanding of the way their thoughts and their words reflect—or dissent from—the contemporary culture of France and of England. all at 12:00 PM in the Whitridge Room. To register for the full seminar, click here. Single sessions are $20 per person apiece. To register for single sessions only, call the Events Office at 212.288.6900 x230. Registrants will receive a reading list with links to recommended booksellers.